“I submit that if he were here today, he’d have to include back pain,” Caputy said. Caputy’s addition came at “Healthy Aging IV: Maintaining a Healthy Neck and Back,” the most recent installment of the Frontiers in Medicine lecture series, which is designed to connect members of the Washington, D.C. metropolitan area with health care experts at GW. 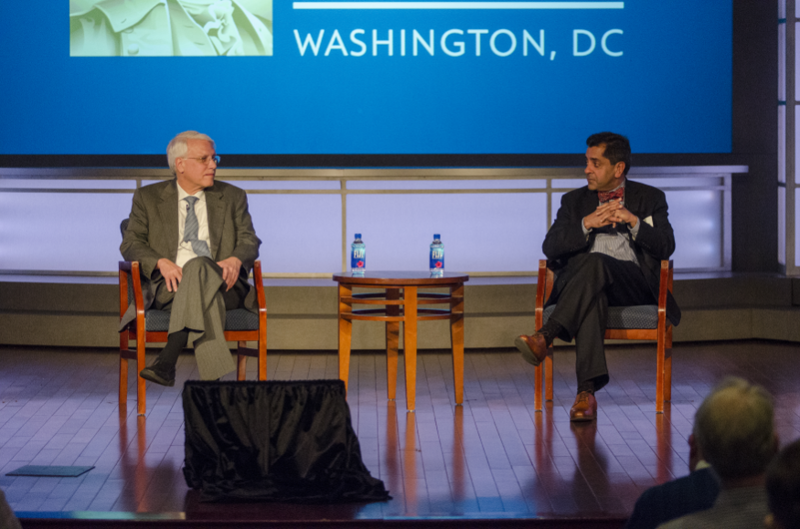 Caputy, who is also the Hugo Rizzoli Professor of Neurological Surgery at SMHS, and Raj Rao, M.D., chair of the Department of Orthopedic Surgery and professor of orthopedic surgery at SMHS, focusing on back and neck pain, respectively, outlined the causes, treatments, and outcomes of pain that commonly affects Americans. Eighty percent of Americans, Caputy said, will have back pain within their lifetime, and among those already experiencing pain, 15 percent report it lasts more than two weeks. The good news is that most flare-ups are short-lived, with 50 percent of people recovering within four weeks, and 95 percent within three months. Causes, for the most part, boil down to one factor: activity. Additional causes can include trauma, infection, cancer, and rheumatologic conditions, among others, and treatments can vary, depending on the diagnosis. The most common conditions are disc herniation; lumbar stenosis, which is broadly categorized as arthritis; spondylolisthesis, or vertebrae slipping forward; and scoliosis, or curvature of the spine. Physicians typically conduct a physical exam, assess symptoms, and use imaging, particularly for more severe cases, and then discuss possible options, including expectations. “For the surgeon, it’s easy: the goal is to relieve pain and preserve neurologic function, but what is the patient’s goal? Is it that he wants to go back to running, play golf, tennis, play with his grandchild?” Caputy asked. Generally, Caputy recommends bed rest for the first 48 hours after a sudden onset of back pain, with doses of Tylenol or anti-inflammatory medication and alternating heat and ice. After those first two days, he encourages patients to engage in more active treatment options, especially physical therapy, as well as massage, acupuncture, and even a trip to the chiropractor. In more severe cases, Caputy suggest injections, particularly at selective nerve root sites, which tend to be the most successful; patients usually recover within 90 days. Other treatments include percutaneous interventions, such as minimally invasive annular heating procedures or newly available intra-disc cell transplant technology. Surgery is a last resort, with discectomies, laminectomies, and fusions as possibilities. If patients want to avoid surgery — though there has been an evolution toward minimally invasive options — and back injuries, Caputy says prevention is simple. Approaches to neck pain are similar. “The biggest difficulty [with neck pain] is probably not the technical part, but dealing with people’s expectations that their neck is going to last 100 years without trouble,” Rao explained. During the examination, physicians determine what simple or complex conditions — such as shoulder tendonitis or irritation of the ulna nerve at the elbow — could be masquerading as neck pain, and look for symptoms that help identify the underlying cause. Those with myelopathy, for example, may have an unsteady gait, a loss of balance, and an inability to open and close their hands easily. Like back pain, treatments include activity modification: physical therapy, postural changes, stretching, and a gentle course of exercise. Rao cautions against using too much medication — he refers to it as “chemical garbage” — and he also believes surgery, such as discectomies, laminoplasties, and laminectomies, should always be the last course of action. “The goal of surgery, regardless if you go in from the front of the neck or the back of the neck, is the same: we want to rearrange the anatomy in the neck so that the spinal cord, which is the cable that carries your electrical signals, has as much space and is as uncrimped as possible,” he said. Both Rao and Caputy warn against smoking, which can directly impact neck and back pain.